Sadly, I do see many clients come from nutrition programs that are under-feeding them by 30-50% of what they actually need to be eating, but most situations are not that extreme. Instead, in a lot of cases their macros would seem pretty darn high compared to what an average person eats. With permission, I want to tell you Mia’s story. Mia came to me several months ago looking to take her performance to a higher level. 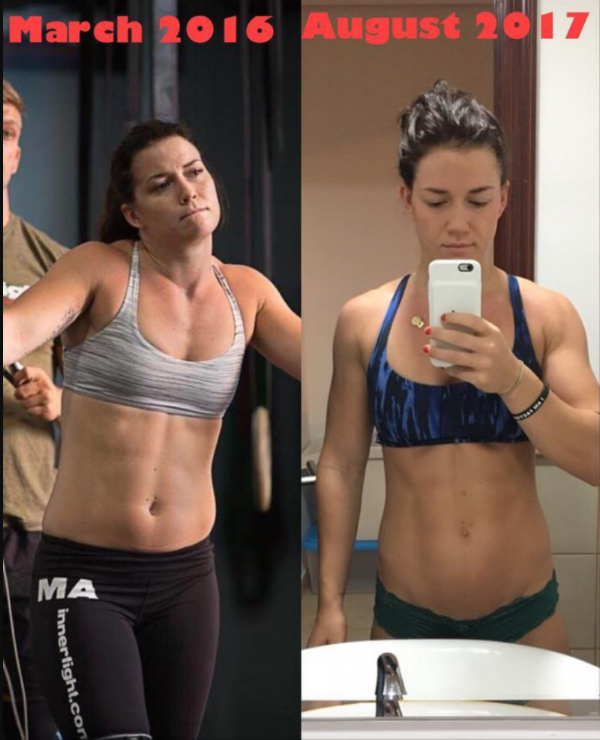 She is a top-level Crossfit athlete that lives in Dubai and competes in the Meridian Regional. 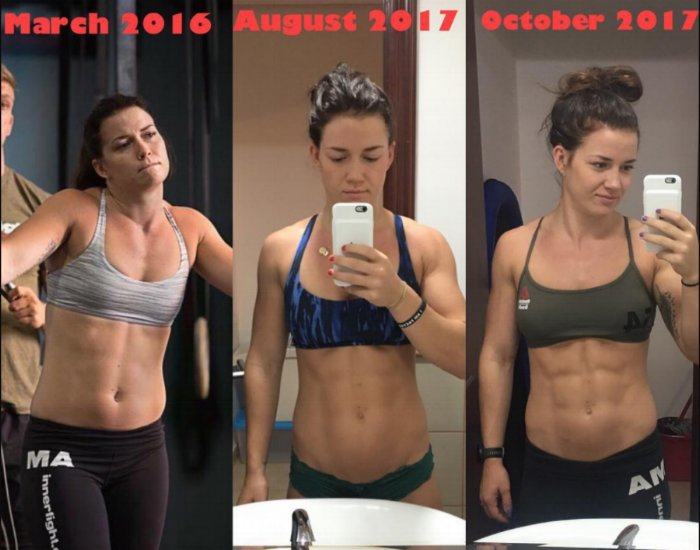 Before contacting me, Mia had worked with another coaching service that had done a solid job of increasing macros from not nearly enough to about 160P-75F-300C (2515 calories). As Mia said in her own words, she had great results with these changes! Mia is 169 cms (5’5’’) and came to me about two months ago weighing between 68-69 kilos (~150-152 lbs). She is a very dedicated person and I can tell you that she probably stuck to her former macros better than most would. I can also tell you that she trains quite hard, on average between 4-5 hours a day and spends the rest of her time coaching other athletes, so she’s always on the move. There were no OBVIOUS red flags that she was headed in the wrong direction other than waking up a few more times per night than we’d like, but even that wasn’t out of control. Mia looked FANTASTIC before we started working together and was a Regional level athlete… so there can’t be much wrong here, right?? Well… just because something seems reasonable, doesn’t mean we can’t be doing better. I think most people under-estimate the amount of work that elite level athletes can do is 4-5 hours. CONSERVATIVELY Mia’s basal metabolic rate is probably in the 1600-1800 range. With 4-5 hours of training we can also CONSERVATIVELY estimate she was probably burning another 200 calories per hour of training (and probably more). NOTE: keep in mind that Mia can probably hold an 800 calorie per hour row pace VERY easily… so any aerobic work drastically increases the total caloric output. Put these two numbers together and you can see that she’s probably needing somewhere between 2600-2800 calories per day and maybe more. Not wanting to completely freak her out, I started her with 2676 calories with a 149P/72F/360C split about 2 months back and then recently bumped her up to 149P/72F/400C (2836 cals) in the last couple of weeks. Thats's about a 12% change... not a big deal, right? Here’s the results. Just a little change in her macros, and in 2 months we see a huge benefit… and not just in the mirror. In that time frame, Mia’s more or less stayed right around 68 kilos, but she looks considerably leaner. Her performance, which was always amazing, seems to be headed in the right direction as well. Mia’s incredibly strong with Olympic lifts that challenge 90% of men in Crossfit. However, she’s still seen gains in that department with a recent clean and jerk PR (happier Central Nervous System!!!). She's also seeing BIG improvements in endurance and gymnastics movement as well, PR'ing both her 3K and muscle ups recently. Most importantly, Mia FEELS better with more overall energy, better recovery between sessions and less overall fatigue at the end of the day. You rock Mia… very happy to have you on-board. Thank you for letting me share your story. If everyone responded the same way that Mia, Bri and Casey did, I’d either be out of a job or rich AF and on an island somewhere. The reality of the situation is that most people are going to take longer to get to the body composition goal than they want to. I recognize that sharing this “instant” success stories probably doesn’t help people that are struggling to see the same progress. To explain why someone people struggle even when we fix their diet, I need to dive into some science. Sorry. There are a good number of consequences that can occur when we train really hard and under-eat (specifically on carbohydrates) resulting in increased stress levels. Decreased thyroid function, altered cortisol production, decreased testosterone production (yes, women make testosterone too), altered/suppressed immune function and muscle breakdown all are possible. A person in this state feels a little sluggish, might be irritable, has more frequent upper respiratory tract infections, more frequent nagging injuries and generally struggles to make progress. I’ve touched on adrenal issues before with low carb, so I want to focus on the thyroid this time. Our body produces a critical hormone called T3, which when active is responsible for maintaining an appropriate metabolism through the regulation of blood glucose levels. A good way to tell if you’re low on T3 without an actual diagnosis is if you have a “cold” feeling even when your surroundings are at normal temperatures. An important, often cited study called the “Vermont Study” found that T3 is sensitive to carbohydrate intake, and when you decrease your carbs too low, T3 levels typically drop as well. What’s worse is that there’s another hormone called rT3 (r stands for reverse) that’s job is to inhibit the function of T3… and decreased carb intake is associated with higher levels or rT3. Importantly, studies where calorie intake is controlled but carb intake is modified consistently show the same effects on T3 to the Vermont Study. Ladies, I’ve got bad news for you. All of the things we’ve just discussed seem to happen much more frequently in women, perhaps because of evolutionary biology causing women to have higher body fats to appropriately maintain pregnancies. Sadly, you have a 4X higher risk of developing a thyroid autoimmune disease that ends up blocking the function of the thyroid. Once the immune system has recognized a "self" tissue as a threat and started a response against it, its really difficult to get it to stop. That said, just throwing your hands in the air and stopping is NOT the answer. While a number of autoimmune diseases seem to respond favorably to ketogenic or low carb diets, hashimoto’s thyroiditis seems to be a bit of the exception. If it was me, I'd probably run a medium to high carb diet but mostly avoid gluten as there's a strong correlation between Celiac’s and Hashimoto’s. OK, all of this is great but it doesn’t fully explain why some people struggle to lose fat when they increase their carbohydrate intake. There’s no great explanation, but genetic differences seem to be at play. However, its still REALLY important to maintain that increased carbohydrate/calorie intake. If for no other reason than improved overall health. There is some evidence to suggest that supplementation can help push us in the right direction as well. There’s no need to reinvent the wheel, but if you’ve been struggling to get your body fat down despite eating a solid diet, I’d highly recommend checking out these two links which highlight the work of Dr. Bryan Walsh, a really great mind in this industry (see below). DON'T GIVE UP! Remember that I've had clients take ONE TO TWO YEARS to restore the overall health and get the body composition, performance and health changes they want. While that's of course frustrating for both of us, the good news is that the changes we create will stick. We didn't use an unhealthy, non-sustainable approach that will ultimately lead to a yo-yo weight gain scenario.